Direkte Düne Zugang zu diesem wunderbaren 3 Schlafzimmer 2 Badezimmer Haus über der Mündung des Flusses Umpqua und dem Pazifischen Ozean. Entspannen Sie im privaten Whirlpool mit herrlichem unverbauten 180-Grad-Ansicht. Das Haus ist gut eingerichtet und sehr komfortabel für einen Aufenthalt von ein paar Nächte zu einem Monat. Es gibt viele Aktivitäten in der unmittelbaren Umgebung zu nutzen. Von ATV Zugang zu den Dünen, zum Fischen, Krabben und Strand Kämmen. Lokale Restaurants sind eine halbe Meile entfernt und der nächstgelegene Flughafen ist 20 Meilen entfernt. Es gibt eine wunderbare Terrasse, Deck und Feuerstelle für Ihren Einsatz und Freude während Ihres Aufenthaltes bei uns. Master-Suite mit Kingsize-Bett, ein eigenes Bad und einen Whirlpool und privater Terrasse. Ausgestattet mit 1 Kingsize-Bett im Master, französisches Bett, und ein Zwilling. Had a wonderful time staying at the Healy Hide away. House was fantastic with a great view and easy access to the Dunes. We will book again. We had a wonderful time and enjoyed using the hot tub and grilling up dinner after a day on the dunes. House is well maintained and kitchen has everything you may need. Also, there is a fire pit in the back for roasting marshmallows and enjoying a nice fire. Direct dune access can’t be beat! 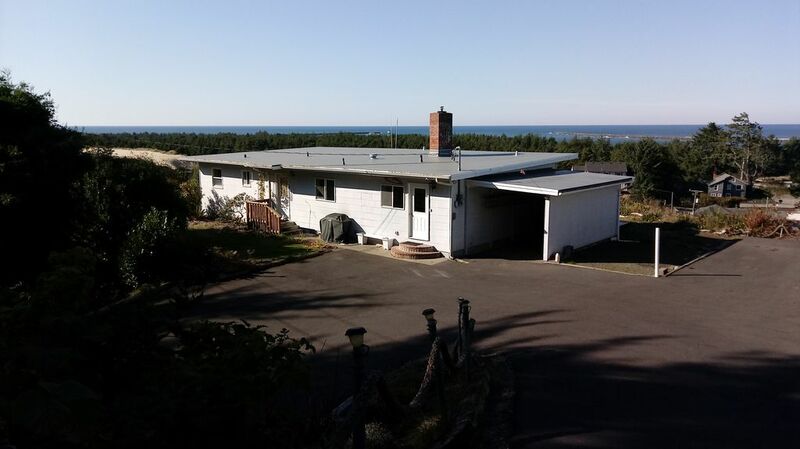 Great views, nice house, dune access. We had a great time at this Winchester Bay location. The house was perfect when we arrived, including fresh baked cookies. The kitchen had everything needed to cook and had condiments from other guests in the fridge (Ketchup, mustard, mayo). We came to ride the dunes and the access was super easy and the views out the window were fantastic. If you are bringing trailers, there is room, the driveway is tight and you will have to do some jockeying but it can be done, just like the dunes - scout it first. We will definitely be back to this location. Thanks so much! We look forward to your next visit to Healy's Hideaway. Great views. Very clean. Dune access. Not a cramped little place, plenty of room in the living room and kitchen. Cookies were on the counter when we arrived! Thank you for your great review. We enjoyed having you as our guests this past week. Thank you for taking good care of our home. We will continue to make new improvements so that Healy's Hideaway will be even more enjoyable. We look forward to your next stay at Healy's Hideaway. Nice house with dune access! We love this house! Great views & direct dune access! The driveway is steep and narrow but other than that it is FABULOUS! Wir haben direkten Zugang zu den Dünen und dies ist ein beliebter Ort der Geländefahrzeuge. No pets currently accepted, no events or raucous parties.